Sienna Resources (SIE—TSX.v) (A1XCQ0 –FSE) (SNNAF—OTCBB) is pleased to announce that it has significantly increased the land holdings on its Slättberg Cobalt-Nickel-Copper Project in Sweden. This new Slättberg exploration license contains 4 old mines with one being the historic Mårtanberg copper mine, which was operated in the late 1700’s and early 1800’s. The Mårtanberg field is known for its copper-rich skarn-style mineralization. The underground workings extended to depths of 80-100 m, and little to no modern exploration has been conducted in the area. We plan to bring modern techniques and views to this added acreage. The Slättberg Cobalt-Nickel-Copper Project now consists of 3 exploration licenses covering 12,733 acres and at least 16 historic mines. On January 30, we announced that initial results have been received from the ongoing magnetic survey work on the Slättberg Cobalt-Nickel-Copper Project in Sweden. 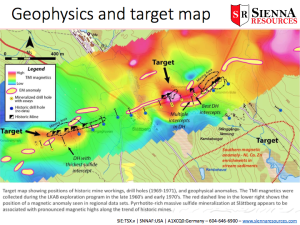 High resolution magnetic surveys in the area of historic nickel-copper-cobalt mines have defined multiple strong magnetic responses along the trends of mineralization. These areas of strong magnetic response are interpreted to represent steeply plunging bodies of massive sulfide mineralization that is rich in pyrrhotite. The magnetic data appears to confirm additional continuity of drill defined zones of mineralization known from the historic drilling. Along with the historic drill data, this new magnetic data is being used to define multiple high priority drill targets for the upcoming drill program. Sweden is at the forefront of an exploration and development boom in the mining industry. The country’s favorable business environment includes a low corporate income tax rate, a proactive geological survey, and broad public support for export-led resource extraction. Sweden has a long history of mining, and is host to some of Europe’s largest active mines. This new acreage was acquired via the SGU (Swedish Geological Survey) website.